South Australia’s Eyre Peninsula is an out-of-the-way destination which could easily be bypassed, yet it’s a beautiful region in its own right and well worth exploring. The peninsula’s west coast is jam-packed with breathtaking coastal scenery, fascinating landmarks, intriguing history and also happens to be the home of the world’s only permanent mainland sea lion colony. Our journey starts in the quaint town of Elliston, 168km north-west of the peninsula’s largest city, Port Lincoln. Situated on picturesque Waterloo Bay, this 400-resident township quadruples its population during the summer break and it’s not hard to see why. A short drive north gives access to the Anxious Bay Clifftop Drive, a stretch of dramatic coastline with massive cliffs, affording breathtaking views. 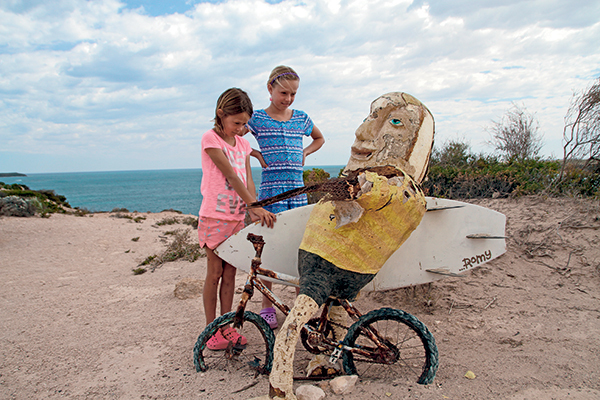 An added attraction is the fascinating sculptures, placed on the cliff tops, to tell their own story. From life-sized thongs to a wooden salmon pole, this is where you can let your imagination run wild. 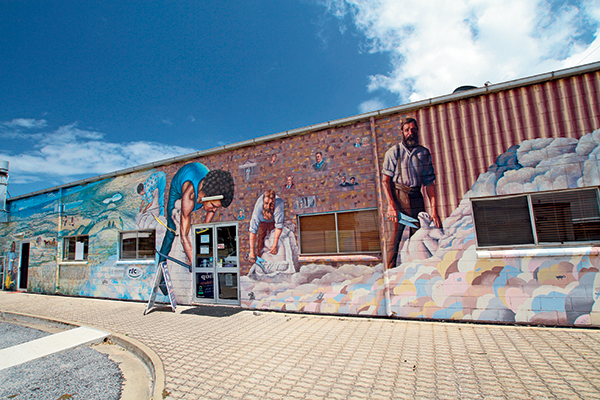 A visit to the Elliston Community Hall – also home of the Visitor Information Centre with a great art and craft shop – is mandatory, as the colourful mural depicts life in Elliston, both now and in the past. Interestingly, the origin of the town’s name has several explanations. Planned and named by Governor Jervois in 1878, some say Elliston was named after Ellen Liston who was a governess for a local pioneering family. Others claim the town was named after Samuel Berdon Ellis, a friend of Governor Jervois. Still others think there’s a link to Sir Henry Walton Ellis who died of wounds in the Battle of Waterloo. Take your pick! Further afield – about 50km north - the coastal escape of Venus Bay is a fisherman’s delight, featuring a picturesque, calm bay where King George whiting, salmon, garfish, snook, flathead and gummy shark can be caught. The 30-strong township was named by Robert Venn who sailed into the bay in 1848 in his schooner Venus. The Venus Bay Caravan Park is the only caravan accommodation on the tiny peninsula and has absolute beach frontage. Try not to miss the spectacular Talia Caves either, south of Venus Bay. The Woolshed Cave is accessed via a wooden staircase and gives insight into the destructive force of the ocean. The cave’s honeycombed ceiling is a great hiding place for birds. A few kilometres down the road, the Tub features a large crater with a tunnel connection to the sea which can only be accessed safely at low tide. This impressive structure is 10-30m deep and 50m across. 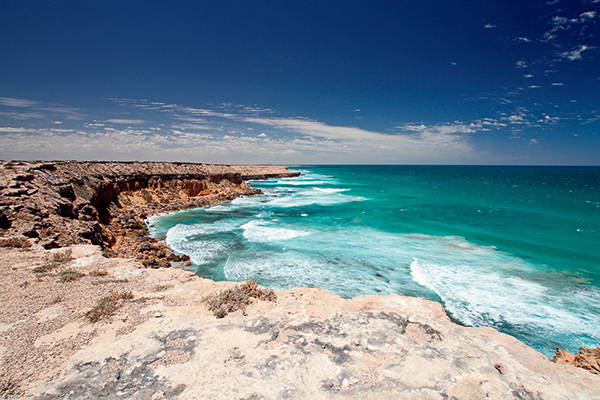 Continuing our journey up the west coast, next stop is Streaky Bay – the emerging tourist hub of this region. A lively main street with funky coffee shops, a well-stocked newsagent and plenty of other stores make for an enjoyable stay in this seaside town. 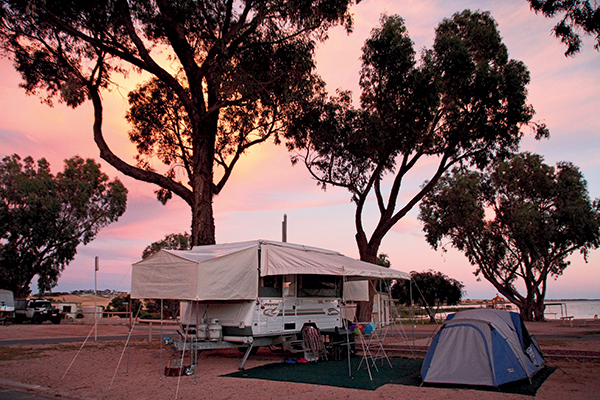 The Streaky Bay Foreshore Tourist Park is apparently the place to go – the prospect of a beachfront powered site was too good to pass up. Word of mouth has made the park extremely popular over the years, for different reasons. The facilities are maintained meticulously, two fully-equipped camp kitchens are any camper’s dream and the foreshore is the perfect playground for all. Attractions abound, from scenic drives and museums to wind-worn rocks and watching sea lions in their natural environment. 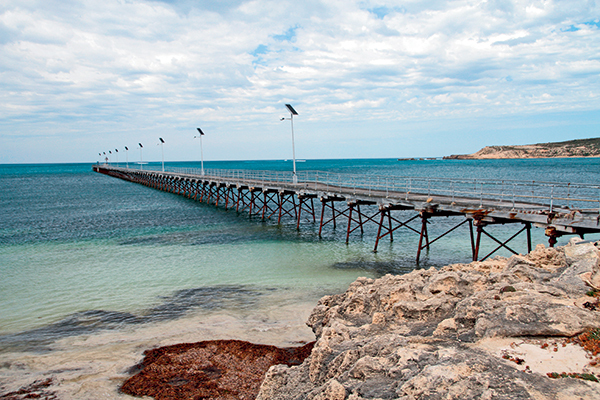 Streaky Bay is spoilt with three scenic drives, each with a distinct flavour. The Point Labatt Sea Lion Drive is undoubtedly the favourite and a must-do experience. The 47km stretch to Point Labatt is sealed and well signposted. A special viewing platform was erected 50m above the colony to enhance the experience. It is advisable to bring binoculars so you can see these interesting creatures up close. Watching these fascinating marine mammals in their natural environment is a rare privilege. Hunted to the brink of extinction until the abolition of commercial sealing early last century, the Australian sea lion has recovered but still remains one of the most endangered marine mammals on earth. 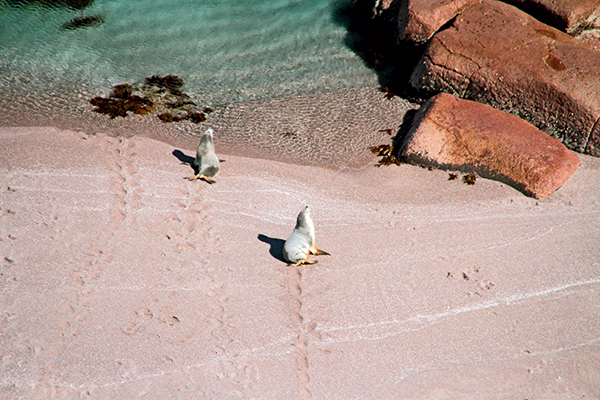 Today, this colony presents the largest mainland population of Australian sea lions in the world. 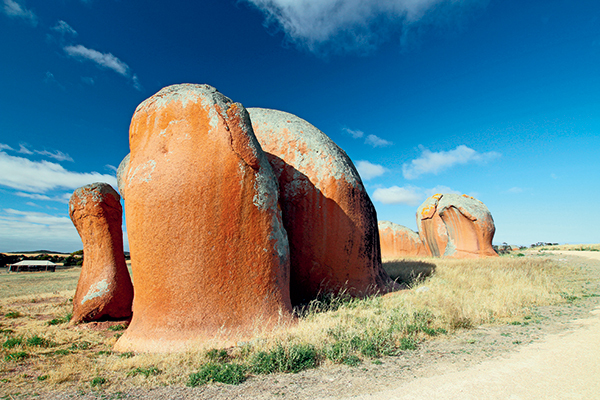 Returning to Streaky Bay via Calca Road will bring you face to face with the remarkable Murphy’s Haystacks. These uniquely shaped rocks and boulders suddenly appear in the landscape, transforming ordinary paddocks into a geological wonder. These pink granite boulders seem to glow in the sun’s last light, making it a must-visit spot for photographers. And the origins of the name? Well, local legend suggests that a 19th century land owner, Mr Murphy, had a visit from an overseas agricultural expert who mistook the rocks for haystacks. Far-fetched maybe, but it stuck. 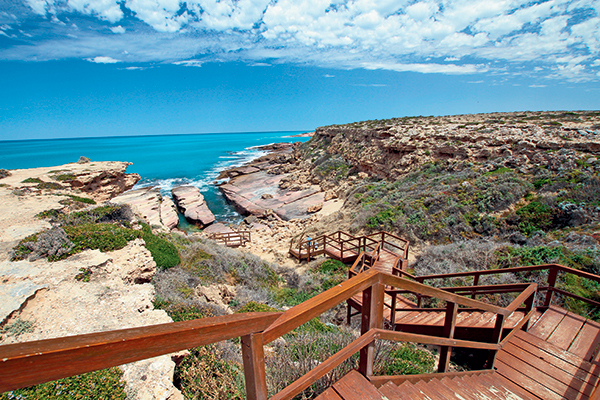 In a nutshell, the Eyre Peninsula’s west coast is a destination in its own right, treating the visitor to dramatic coastal scenery, unique wildlife and beautiful camping spots – make sure you place it on your next itinerary. 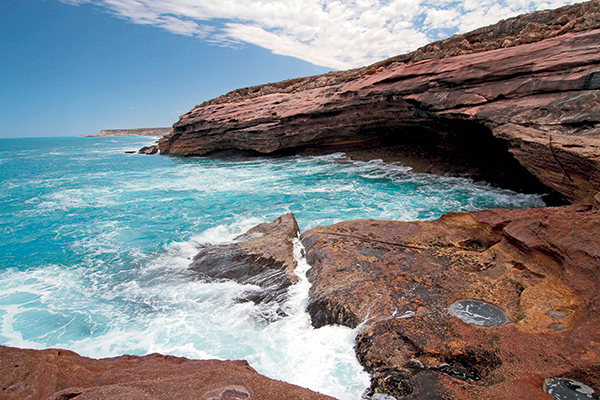 The town of Elliston along the Eyre Peninsula’s west coast is an easy 700km drive from Adelaide along sealed roads. Streaky Bay is 127km north of Elliston on sealed roads. 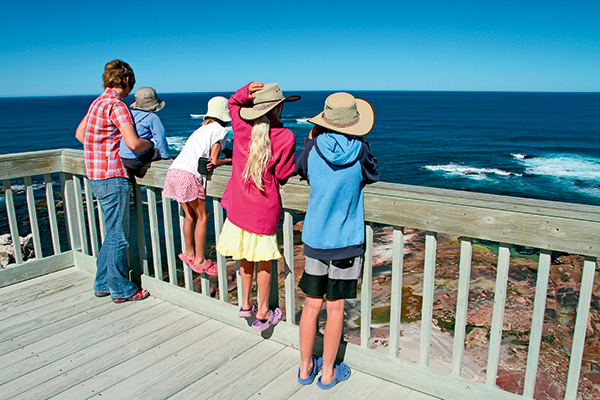 Elliston Waterloo Bay Tourist Park is situated within walking distance of the centre of town and the jetty. Grassy sites, a camp kitchen and a jumping pillow make this park the perfect location to explore this region. Visit www.elliston.net for more info.